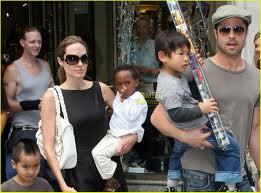 Brad Pitt and Angelina Joile let the kids gorge on jund food, from Cheetos to McDonald’s. Scenario I: The kids can’t watch mommy and daddy’s action movies just yet. “I can’t show my kids movies where people are trying to kill me,” Angelina says. Parents using many different styles of parenting shield their children from various kinds of situations. For this family, I think this is a good decision for a few reasons: kids can be very concrete in their thinking and may get very scared watching these kind of images; there are movie ratings for a reason and even though the actors are their parents, these kids have the same developmental and emotional needs of others their age—if they aren’t 13, they shouldn’t be watching PG 13 movies; the same reasoning applies to R movies. However, I think it would be great for the kids to be able to see clips of the movies. Scenario II: Junk food is on the menu. The Brangelina brood have been photographed munching on everything from Cheetos to McDonald’s. Many adults using various styles of parenting think that the choices should be theirs. However, I think it’s great for kids to be given some control over as much as possible, such as hair styles, clothing, etc. There can be some guidelines set. For example, with my own son, he had free reign to decide on hair cuts, with the exceptions being that he couldn’t shave his head or grown his hair down to his shoulders. With Shiloh, Angie honored her child’s request. I think that was a good thing. I have watched mothers make decisions about their kids’ hair that make the kids miserable. Boys who want the latest look, but mom likes it the old-fashion way. Girls who want to cut their long hair and moms who insist that they don’t cut it. One mother was sorry that she cut her hair when she was a teen, and so is not allowing her daughter to cut hers. I don’t think parents should dictate some aspects of a child’s appearance. Same thing with clothes—if kids want to express themselves either in a fashion statement or for comfort, they should be allowed to do so —again, within certain guidelines. For instance, jeans may be OK most of the time, but church clothes are required on Sunday. What do you think of this parenting style? Are they too relaxed? Please feel free to comment about styles of parenting in the box below. This relaxed style fits our family the most. We consider ourselves very aware and moderate, setting boundaries but encouraging choices. With self-esteem and pressure from peers being such a growing issue, I think enlisting self-expression at a young age is really great. With our girls, we say as long as it’s appropriate, you can wear it. We end up with a lot of plaids mixed with polka dots and so on, but who cares, they like it. I agree with Angelina’s ability to let them be kids and have some cheetos every now and then. I have friends who do not allow any junk food, and I watch their kids try to sneak it when mom isn’t looking. The Cheetos are well within their reach at home, yet my kids don’t take it themselves, instead they come to me beg me and beg me for Cheetos…sometimes they get it and sometimes they don’t. I feel this relationship is much healthier than the kid who is trying to sneak it. If everything is banned or out of sight, then kids don’t learn how to moderate themselves and make good decisions. It’s not about never encountering a Cheetos…it’s about what kids decide to do when they do come into view. Thanks so much for commenting! Great hearing from you. Enjoy your kids! Ugh I wish my mother was like this when I was a kid! I was miserable from childhood to my teenage years. I was forced to wear the flowery dresses and be all girlie, with the exception of my hair. When not in a frilly dress I was being mistaken for a boy because my hair cut was so dang short! I HATED IT! !